Uniregistry app is slick, simple, and comes with an Easter egg. Domain management screen on Uniregistry app. 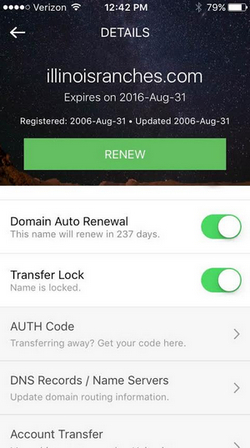 Uniregistry released an iPhone app for its registrar service today. Now, those that have read this blog for a long time know that I’m not a fanboy. I don’t fall in love with a particular company or its products, and I write about the good and the bad. But damn, this is a great app. So simple. So beautiful. It took just moments to get familiar with the app and how you can use it to manage domain names on the go. Logging in, even with two-factor authentication, is a snap. You can then use TouchID. The screenshot on the right encapsulates how easy it is to use the Uniregistry app. Instant date information. One click toggles for whois privacy, domain auto renew and transfer lock. Easy auth codes, DNS changes and account pushes. Two-click domain renewals. Many of these features are on the web interface, but they become much more critical on an app. There’s also an Easter egg in the app. Uniregistry promises that something cool will happen during Frank Schilling’s keynote at NamesCon next week. 80% users from developing countries are on android. Still, they don’t care about them. The Uniregistry android app launches in March 2016 (or sooner). Although if you’d prefer not to wait, this is a great time to switch to a more stable platform by buying an iPhone. Most of the Android issues happen with crappy phones that most people don’t buy; those who buy Samsung, Motorola (now Lenovo) or Google get pretty stable platforms that keep being upgraded. My Moto G(which is not their top line, Moto X) just got upgraded to Android 6 (Marshmallow), it came from factory with Android 5 (Lollipop). Sounds like Frank and team are doing quite a bit for Uniresgistry to make it the best platform out there for domains. I agree with the above on the good phones to bad on android, but can’t knock Frank for getting the app on the platform he uses out first…..
I’ll just have to wait for the Android app for my Samsung Galaxy. Hope to get the notification for the app (Sooner) than March.